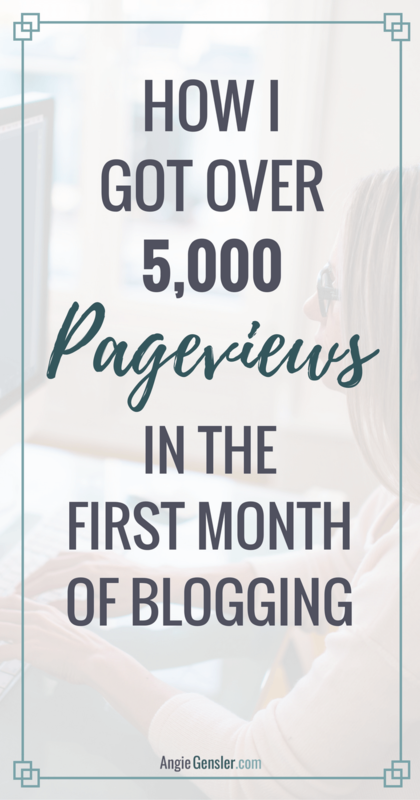 My first full month as a blogger is officially in the books! Let me tell you, since going live on December 18, 2016, it has been a whirlwind! Things are moving so fast I have decided to document my results each month and share it with my readers. I will share the strategies I tested, the tools I used, the investments I made, and the results I experienced each month. I will also provide you with resources and tutorials so you can apply my best strategies to your own business. Since I started this blog in mid-December, I’m going to report on my first 45 days; December 18, 2016 – January 31, 2017. I will also break down my results from the first 30 days; December 18, 2016 – January 16, 2017. I want to show you that instant growth is possible! If you’re pressed for time click here to skip to the tl;dr (too long; didn’t read) summary. Before I dive in and share the results, I want to provide some context around the amount of time I spent on the blog and the help I received. First, I have a full-time job with a commute and two small children. This means my time is very limited and I am in a hyper-hustle mode right now. I wake up at 5:30 a.m. every morning (including weekends) and maximize every second of time I have throughout the day. I still get 7 – 8 hours of sleep every night and I refuse to trade time with my kids for time building my business. I don’t have a virtual assistant and I don’t pay for a bunch of fancy tools or software to make me more productive. What I do have is Trevor! My husband, Trevor, is a stay-at-home-Dad, which means I don’t have to drop kids off at daycare or spend my entire weekend cleaning the house, doing laundry or running errands. Trevor handles all of that. Even more, Trevor is a technical genius and extremely business savvy. He handles all the technology, SEO, and behind the scenes stuff for this blog. That allows me to focus on creating great content and visuals for the blog and all my social media channels. Yep, I pretty much hit the husband jackpot! Ok, now let’s dive into the results and then I’ll walk you through the strategies I tested and what worked best. Having a system to track your weekly and monthly traffic is crucial! Why? You can’t improve or fix what you can’t measure. Tracking your results allows you to easily see what’s working well and what’s not, and alter your strategy accordingly. Now that you know my numbers, let’s talk about the strategies I used to drive traffic and generate leads. Keep reading, because I’m going to share resources and tutorials to help you replicate the same results for your blog or online business. Anyone who says social media doesn’t drive traffic isn’t doing it right! Social media drove 75% of my traffic which translated into 3,088 unique users! When I break the social traffic out by channel, Pinterest generated 78%, Facebook 18%, Twitter 3%, and Instagram 1%. I reviewed my Pinterest and Tailwind analytics and I can attribute most of my Pinterest traffic to two group boards and Tailwind Tribes. Check out my post How to Explode Your Traffic using Tailwind Tribes for a video tutorial on how to get started with Tailwind Tribes. I’ve also created a video tutorial on how to find and join Pinterest group boards. You can also get an inside look at the Pinterest strategies I use to grow my blog in my free Traffic Masterclass. Click here to register and save your seat in the class! Facebook was my #2 traffic source, and I attribute all that traffic to groups. I have not shared the blog with my personal Facebook network and I have around 50 “likes” on my business page. Also, Facebook’s model is pay-to-play, so those 50 people likely won’t see my posts since I’m not paying Facebook to “boost” them. I actively participated in about eight different groups this past month. That activity was responsible for 14% of my total traffic. Groups are amazing and I can’t recommend them enough. To get started with Facebook Groups, read my post, 9 Facebook groups to join to grow your business. Twitter contributed 2% and Instagram contributed less than 1% of my total traffic. However, I’m not discounting those channels for my business yet. The amount of time Twitter and Instagram users spent on my blog was significantly higher than Pinterest and Facebook users. This could mean Twitter and Instagram users are more engaged or it could simply be a sample size issue. I’m going to give these channels a few more months before I disengage. For details on how I grew my email list so quickly and generated 807 leads in 45 days, check out my post How I went from 0 – 100 email subscribers in 10 days. I spent $116 to launch this blog and $29 of that was for the Social Warfare plug-in. Social Warfare is a WordPress social sharing plug-in. This plug-in is easy to use, looks great on my website, and has proven to be a very wise investment. One of the most popular “free” social sharing WordPress plug-ins on the market is SumoMe. We debated using SumoMe but decided the investment for Social Warfare was worth it in the long run since SumoMe charges a monthly fee once you hit a certain number of monthly visits. Thank goodness we made that decision because Social Warfare proved to be well worth the investment in the very first month! SumoMe is free with limited website visits, $29 per month for 5,000 monthly website visits, and $59 for 50,000 visits. We had 5,433 visits our first month, which means we would have had to pay SumoMe $59 in our first month! We paid $29 for an entire year of social warfare and, it’s a much better solution. Do yourself a favor, and invest in Social Warfare. While you’re at it, follow Dustin Stout, one of the creators of Social Warfare. He’s pretty great and shares amazing tips and resources. Tailwind is, in my opinion, the best Pinterest management and scheduling tool on the market. My favorite feature is Smart Scheduling. Tailwind tracks the engagement of my pins and then recommends the best times to pin content. They remove all the guesswork and I can schedule hundreds of pins to go out throughout the week in about 30 minutes using Tailwind. I am in love with MailerLite! It is the most affordable, robust, and user-friendly email management tool I have ever used. It’s completely free until I hit 1,001 subscribers and after that, prices are still ridiculously cheap. Not only can I manage subscribers and easily create gorgeous behavior-based automated email campaigns, but it also allows me to create landing pages, popups, and embeddable opt-in forms. Social Warfare, Tailwind, and MailerLite – those are the three main tools I used this month to drive traffic and generate leads. I used a lot of other free tools to manage my social media, design images, and curate content. Check out How to Schedule Your Social Media Content Like a Boss, Without Spending a Dime, to learn about the other tools I use. Pinterest was the big driver for me so I’m going to continue to focus my energy on Pinterest. I plan to create more pins for each blog post and pin content to my group boards more often. I also plan to participate in more Facebook groups. I know I’m just scratching the content promotion surface and need to diversify my traffic sources. I’m going to double-down on Pinterest, but I also plan to explore a couple other channels this month. I don’t want to put all my eggs in the Pinterest basket. Check back in March to see what I tested and how it went! Trevor has a mild learning disability, making it very difficult for him to comprehend content he reads. Growing up, this made him feel stupid, but he’s actually extremely intelligent. He just needs hands-on demonstrations and tutorials to learn. I think the majority of people learn best from hands-on demonstrations and tutorials. So, instead of telling my audience how to do something, I plan to show my audience how to do something. This month, we launched my YouTube Channel and I produced five tutorial videos. These videos have performed really well and I’ve received amazing engagement and feedback. I definitely plan to produce more video tutorials and my goal is to produce a tutorial video for every single blog post. I might also create a video alternative for every blog post. Instead of reading this post, you could choose to watch a video of me “teaching” the post. Let me know in the comments below if you would prefer to watch a video instead of reading a post. The hardest lesson I learned this past month stemmed from my most popular posts. I’m going to focus on social media training for beginners. Over the next few months, you’re going to see very detailed “how-to” posts with tutorial videos. I’m going to address how to select the best social media channels for your business and how to get started using Pinterest, Facebook, YouTube, Instagram, Twitter, and LinkedIn. Having a system to track your weekly and monthly growth is crucial! This allows you to easily see what’s working well and what’s not, and alter your strategy accordingly. What promotion strategy works best for your blog?